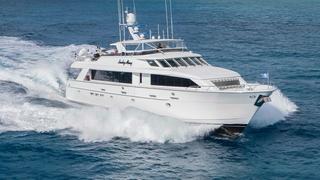 The Hatteras 100 Motor Yacht features a deckhouse layout that has been designed with four general areas. 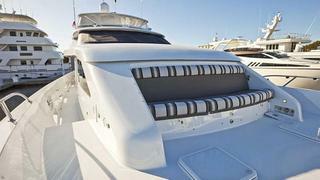 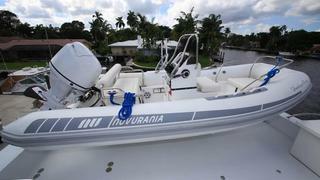 From fore to aft, every area can be custom arranged to the owner's specifications. 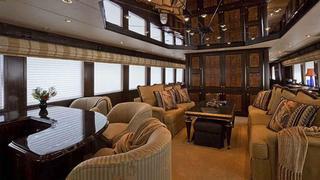 There is also the choice between standard walk­around side decks or the optional wide­body design. 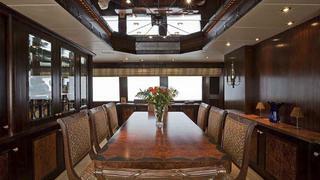 The galley / dining area features three different layouts. 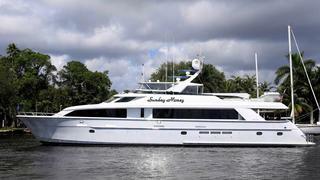 Regardless of which dining arrangement is chosen, the galley is fully­equipped with two Sub­Zero refrigerator / freezers with icemakers, a four­burner cooktop, a standard convection oven, as well as a combination microwave / convection oven. 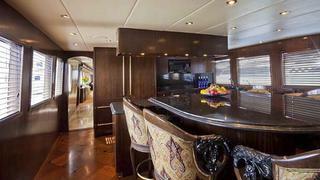 Other galley amenities include a garbage disposal, dishwasher, trash compactor, and generous counter and storage space. 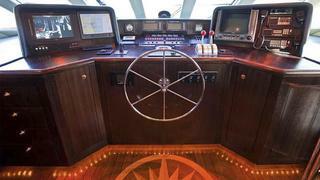 The pilothouse is raised four feet, three inches above the galley floor to accommodate the stairway leading below and to enhance the captain?s visibility. 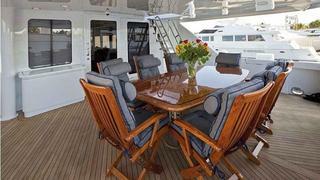 Here, the standard arrangement features an L­shaped lounge with table, desk / chart table, and steps leading to the flybridge. 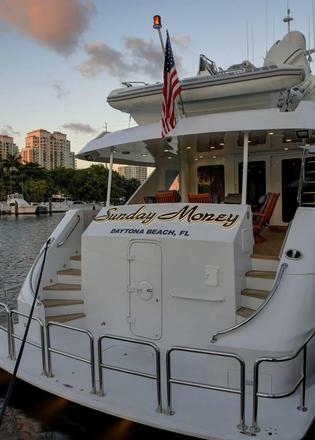 Standard placements in the salon include a day head at the forward end of the salon, a complete entertainment center, as well as a door leading to the aft deck. 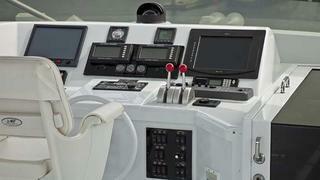 Access to the cockpit or sport deck is gained by either a single or dual port and starboard stairways. 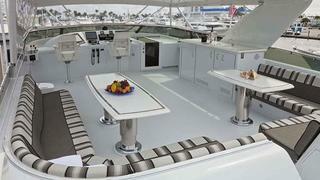 The sport deck is over three­and­a­half feet long, roomy enough to use as an additional sundeck and as an extra­large swim platform. 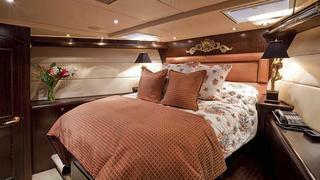 Both the master and guest accommodations can be found amidships. 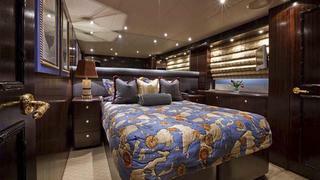 The cabin includes a king­size bed, port and starboard walk­in closets, and a double arrangement head compartment with whirlpool tub. 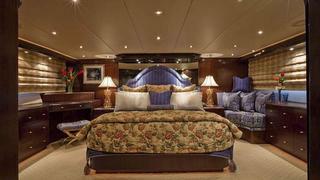 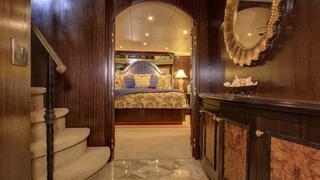 Aft of the foyer, port and starboard doors direct guests to two separate staterooms. 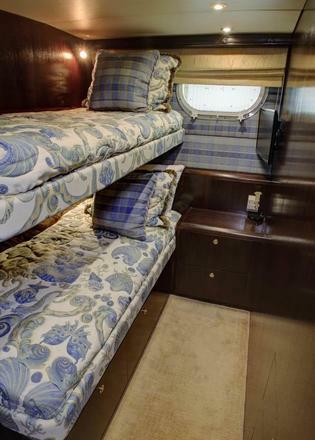 Both staterooms feature an innovative sliding twin berth design with a movable nightstand which can be arranged as either separate twins or a single queen­size berth. 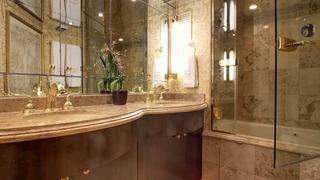 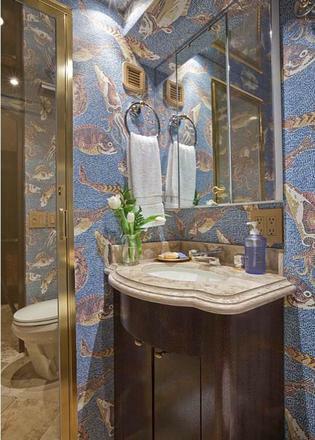 The port stateroom is designed with a stall shower, while a large tub has been designed into the starboard guest head.